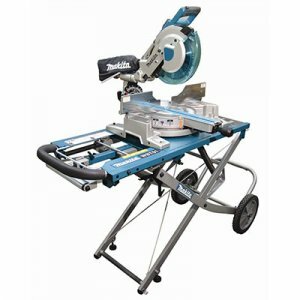 So, you just picked up the LS1016L 10" miter saw from Makita, and now you are in search of a miter saw stand to free up your saw horses. Good news, Makita has just announced a brand new mobile jobsite miter saw stand. The Model 195083-4 miter saw stand adjusts to five height positions to fit workers of all sizes. It also features two out-feed roller stands to support longer materials. If you are working with material in the 14-16 foot range, you will probably have to use additional out-feed stands. The 195083-4 stand also uses large 12 inch solid rubber wheels that should help you get around the jobsite. With the good also comes the bad... the 195083-4 weighs a hefty 90 lbs. When you add the weight of a 50-60 lb miter saw, you are looking at quite a bit or weight when you have to load or unload you stand.